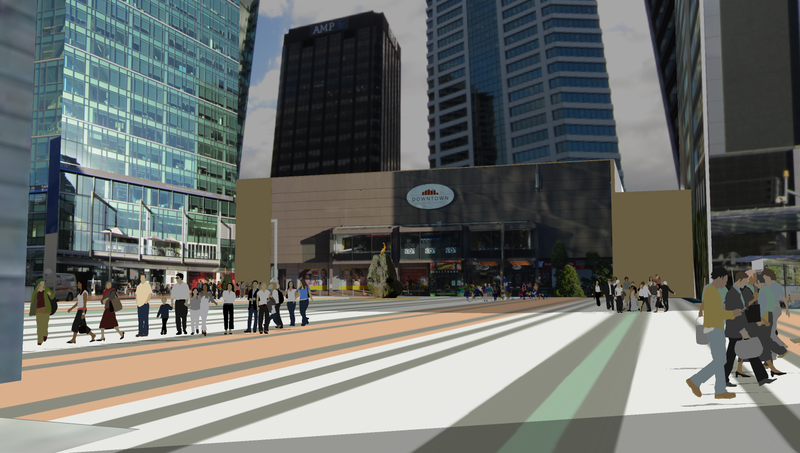 I posted a few renderings last week from a rough sketchup model I made of Queen Elizabeth Square. Showed what might be possible if the bus interchange was moved as has been discussed. A few comments came back supporting the retention of the bus interchange..... So. How about a modern tram service.....? 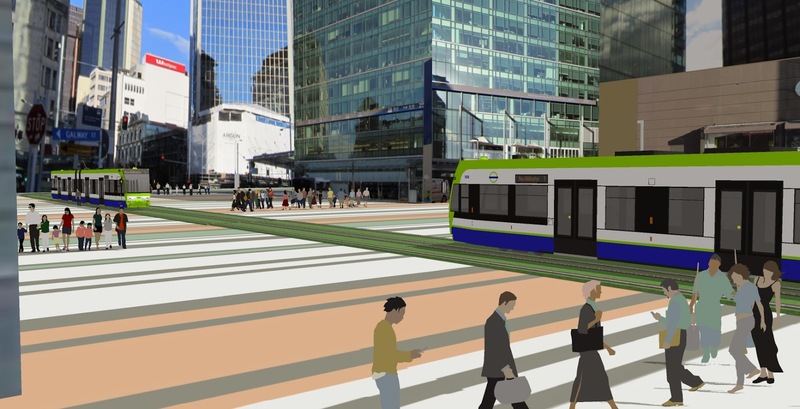 The tram would serve to interconnect inner city public transport infrastructure - such as train, ferry, and the inner city bus interchanges that are being discussed (one in vicinity of East Britomart, one in Lower Albert, and one in vicinity of Victoria Park/Fanshaw Street), and it would, in the first instance, run from Wynyard Quarter, to Fanshaw, into Custom Street West, down Lower Albert, along a little part of a pedestriansed Quay Street, through Queen Elizabeth Square, and up Queen Street. It would be a high amenity service, high frequency - between 2 to 4 minute service frequencies. Like light rail, but good and urban. Here you see the track turning left into Quay Street. This sort of service provides for expansion. For example, at Custom Street, there could be a turn into a line (which would connect directly with the East Britomart bus interchange), turn up Anzac Street, and run along Symonds Street to AUT and University of Auckland. And here's how Queen Elizabeth Square might look with the removel of the old HSBC Tower (which should probably never have been built in that location). 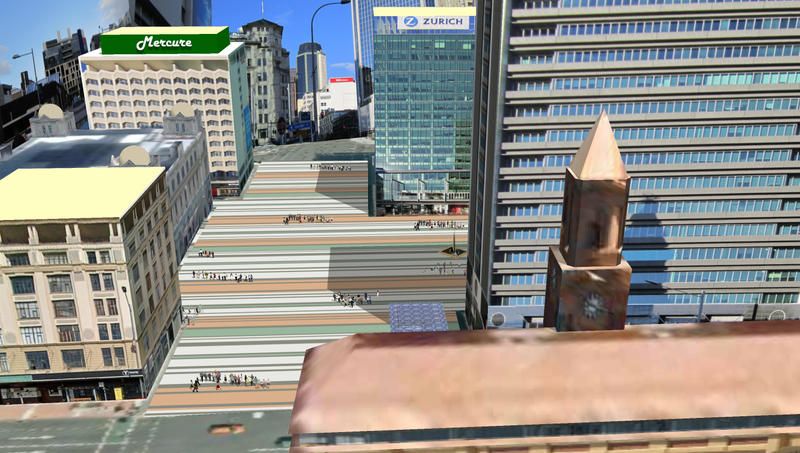 You can see how Queen Elizabeth Square would flow onto Queens Wharf (as was envisaged 30 years ago). Precinct Properties would be free to build a replacement tower on the corner of Custom Street West and Lower Albert. And it would benefit from being very well serviced by rail, tram and ferry services. And the public would gain something which has been promised for decades. 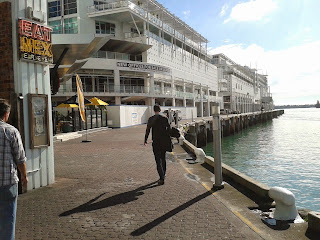 I have written at length about Auckland's Princes Wharf. There isn't much use crying over split milk - but we do need to learn from what happened and ensure the same mistakes are not made again. 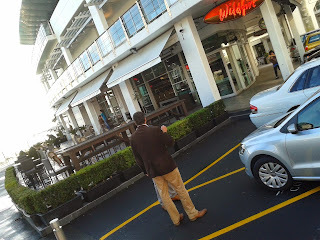 I say "mistakes" advisedly, because there were some major winners on Princes Wharf, alongside the major losers. 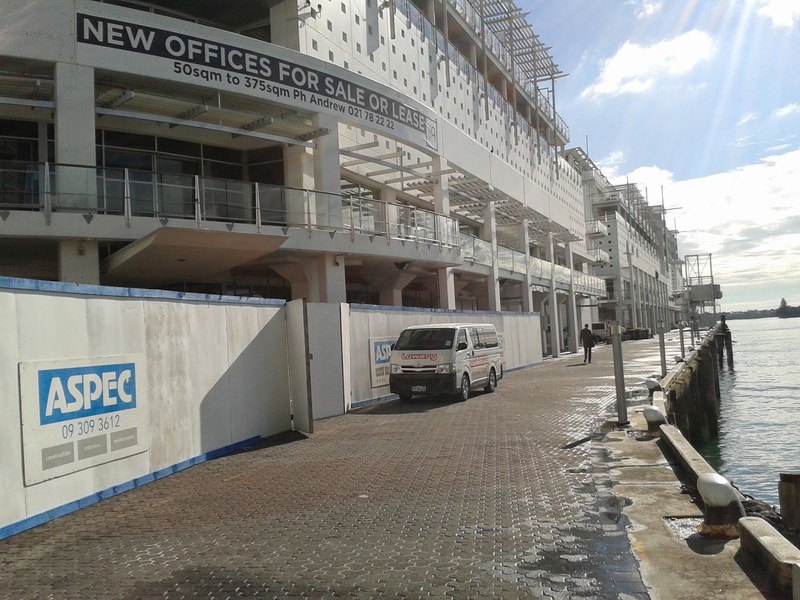 The private developer did very well and so did Ports of Auckland Ltd which pocketed a tidy sum in exchange for selling the leases. 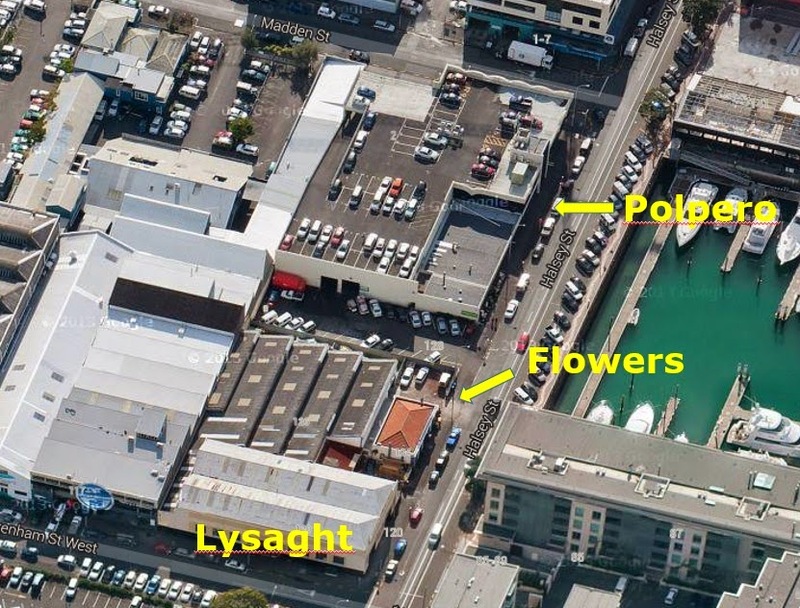 I want to be a little bit constructive in this post, mainly because I - and many others - are not ready to completely give up on Princes Wharf. Something needs to be rescued from the wreakage. (12) All colonnade spaces between the exterior wall of individual tenancies and the outer face of the columns supporting the first upper level, around the entire perimeter edge of the development and along both sides of the central street, shall be set aside as an accessway for the use of the public. You can see the toning down of these words, but the meaning and intention is clear. This picture was taken a few days ago, in the central street, and clearly shows the existence of a public accessway, between the exterior walls and the outer faces of the colonnades. 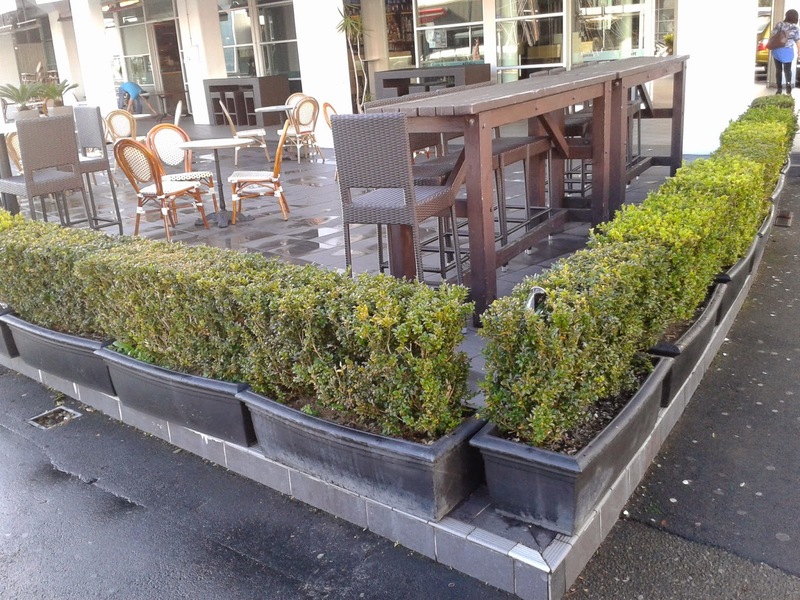 You can see a pot plant a little way along - but apart from that the space is being used in accordance with the resource consent conditions. This picture is at the end of Princes Wharf, and shows again that the open public accessway space between interior walls and colonnades has been respected at deck level. You'd have to say that the space is not that well looked after in terms of being a paved square - and this is partly explained by the ambiguity that exists over whose space this is, and who controls it and looks after it on behalf of the public. Getting closer, you can see the sign: "New Offices for Sale or Lease....", this relates to level 1 perhaps, but what is happening at ground level here....? 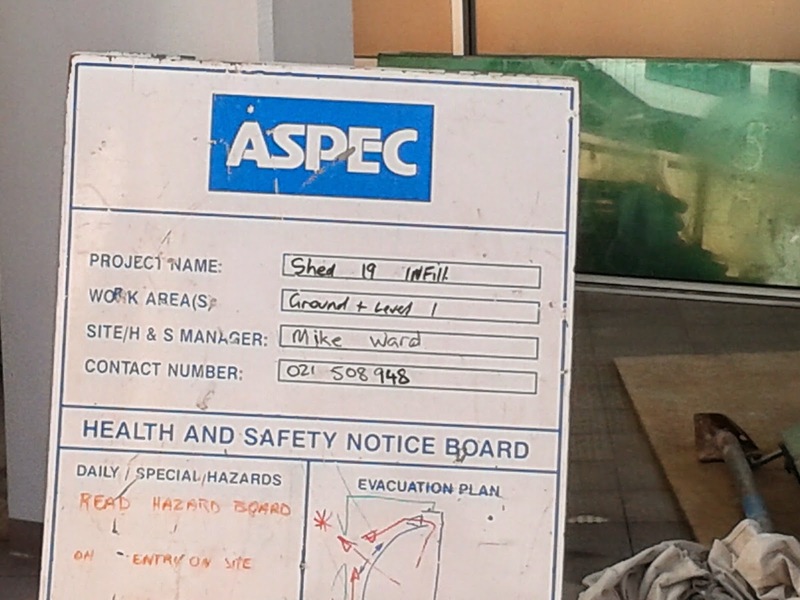 The ASPEC sign reads: "Shed 19 INFILL...."
That's how you describe infill - between colonnades, of public space, whichever spaces are being expropriated for commercial purposes. Who gives permission for this incremental loss and decay of public amenity....? Why is it happening? And who pockets the proceeds...? 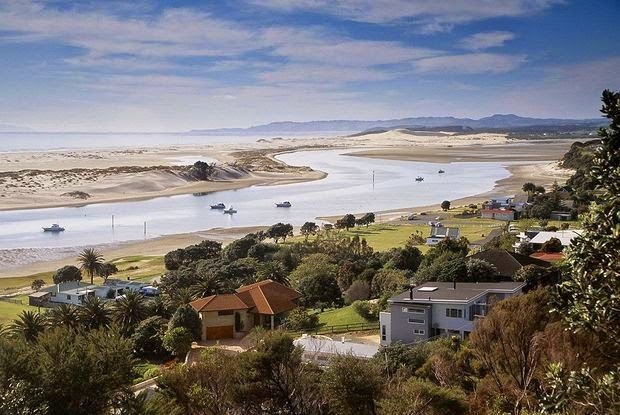 Justice Heath's "unsealed" judgment in respect of the judicial review proceedings brought by Mangawhai Ratepayers and Residents Association (MRRA) against Kaipara District Council (KDC) regarding its management of the EcoCare Wastewater Scheme was released on the 28th of May. The judgment is not sealed because he intends to hear further submissions from counsel about the orders he proposes to make. In summary, however, he has declared that the decisions to enter into both Ecocare contracts were illegal. He has also awarded the MRRA indemnity costs (without being clear what that actually means). The judge is having a conference with the parties on 20 June when he expects to consider submissions about orders he might make to finalise his judgment. that Parliament was constitutionally entitled to bring in the Validation Bill (which validated many prior decisions which have been acknowledged as "unlawful"), and that the timing of the Bill could not be seen (in terms of the Bill of Rights) to be deemed an unconstitutional attack on MRRA's right to judicial review. that the loans entered into by KDC are “protected transactions” for the purposes of the Local Government Act, in respect of which the creditor is entitled to take enforcement action if the Council were to default on its obligations. At an institutional level, this proceeding has exposed a high degree of incompetence among those who were elected to serve on the Council, and also their executive officers. At a human level, it has caused a great deal of stress, anxiety and financial hardship to many ratepayers who will now be required to pay rates at a significantly higher level than they might reasonably have expected. They might also be at risk of a significant capital loss, if they were to sell their properties in an endeavour to avoid continuing costs to meet (potentially) increasingly higher rates. (Ed: In terms of modification 1 and increased costs of the EcoCare proposal....) The Auditor-General said that this increase “was not appropriate”. That is a gross understatement. I find it incomprehensible that a democratically elected Council (in conjunction with its executive team) could decide to increase the cost of a major infrastructure project by approximately $22.1 million without consulting with its constituents; namely, the ratepayers who were to pay for it. It must have been blindingly obvious to the Mayor and Councillors that while ratepayers might (given that the project did not enjoy universal approval) have been prepared to pay increased rates to meet a cost of $35.6 million, it could not be said confidently that they would agree to pay $57.7 million for a similar facility. I am satisfied that the Association has made out a case for a declaration that the EcoCare agreements were entered into in breach of Part 6 of the Local Government Act and, therefore, unlawfully. Having reviewed the evidence on which the Association relies, I am satisfied that the decision made to proceed with Modification 1 agreements failed to comply with Part 6 and that a declaration to that effect should be made. That finding leaves to one side the question whether the financing agreements fall within the “protected transaction” regime, a point to which I now turn. Under the protected transaction regime, even if the Council’s decision to borrow was unlawful, the creditor is left with a valid and enforceable debt owing from the Council. If the Council falls into default of its obligations under the loan, the creditor is entitled to bring proceedings to recover the amount payable. If judgment were obtained, enforcement processes are available. In summary, while the creditor has an enforceable debt, the Council has a number of options available to it. In determining which option to take, it is necessary to have regard to the best interests of its ratepayers. Just like any other entity, the Council has the ability to negotiate to restructure the loan arrangements. If negotiations were unsuccessful, it could legitimately leave its creditors to exercise what remedies are available to it at law, or levy rates to pay the debt. In this case, there is no evidence that such an assessment was undertaken by the Council at the time it struck the rates. For that reason, the Association has not advanced any challenge on any administrative law unreasonableness ground. Nevertheless, in relation to future rates that might be struck, it will be necessary for the Council to give proper consideration to these issues before making its rating decisions. The Association has succeeded in obtaining declarations in relation to the unlawfulness of the EcoCare and Modification 1 agreements entered into by the Council in 2005 and 2006. It also has the benefit of reasoning that suggests that a more nuanced approach must be taken by the Council to the way in which it should deal with creditors, given the Council’s current parlous state, and the effect that significant rises in the levels of rates are likely to have on its ratepayers. Other factors in favour of the Association’s claim for costs are the usefulness of the declarations I will make in respect of potential third party liability and the need for the ratepayers who comprise the Association to contribute to the costs incurred by the Council through their rates. We will await with interest the orders that appear in the sealed judgment. 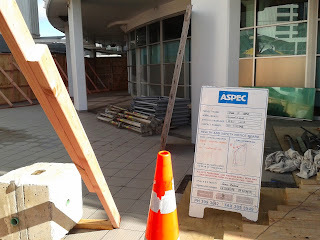 Auckland Council have seen "opportunity" in Queen Elizabeth Square for downtown developers and for a hefty capital sum. There has been urban design criticism of the square - forlorn - neglected - wind swept - some say. This behaviour is what goes with "de-territorialisation". It's a well known process where public attachment and attraction to land is gently undermined, so that no-one really cares when it's gone. Or maybe until it's gone - but by then it's too late. However there are always a few canaries in Auckland's coalmine of development. Which is a good thing. 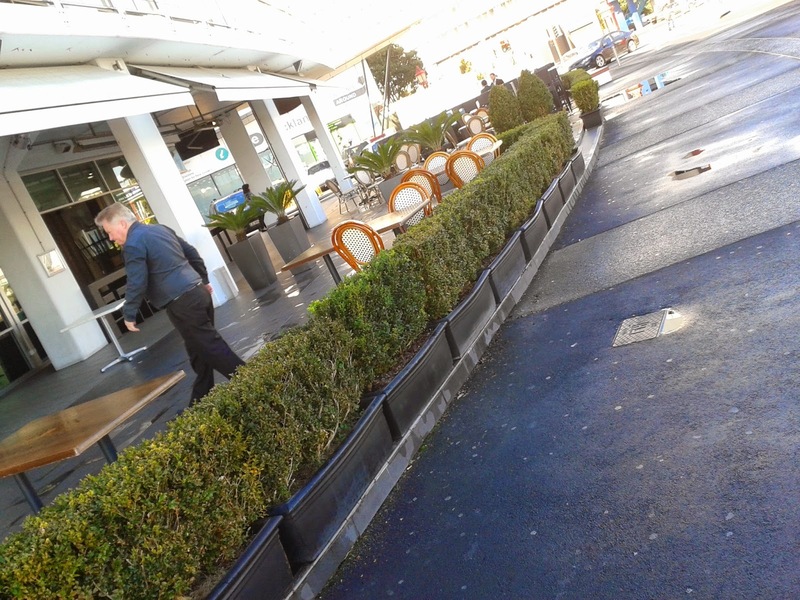 Auckland needs whistle blowers to prevent "de-territorialisation" of public space, and to prevent it being "re-territorialised" as private land. I wrote a few days ago in a posting entitled "Love QE Square". I gave it that name because I wanted to do more than simply "save" QE Square. It needs love, from the public, from people who use it, from those who see other opportunities for it, and from Council. 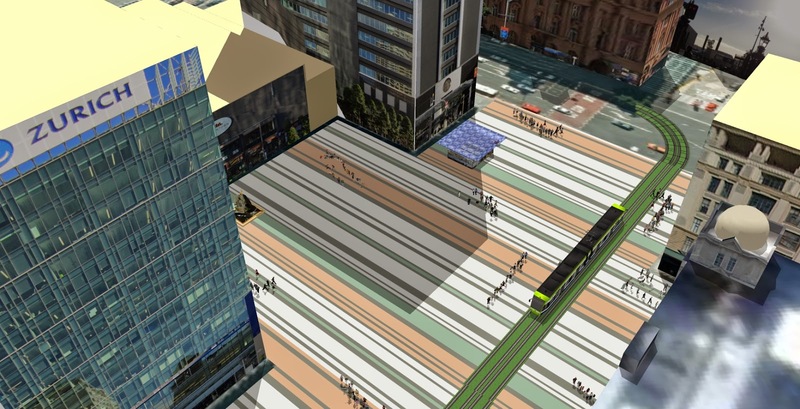 Especially now that Auckland Council is getting close to digging it up to make way for the first section of the Central Rail Corridor tunnel, and now that Precinct Properties is getting ready to develop its downtown buildings and land. The main thing that I've taken away is the bus interchange and through road which bisected the square. 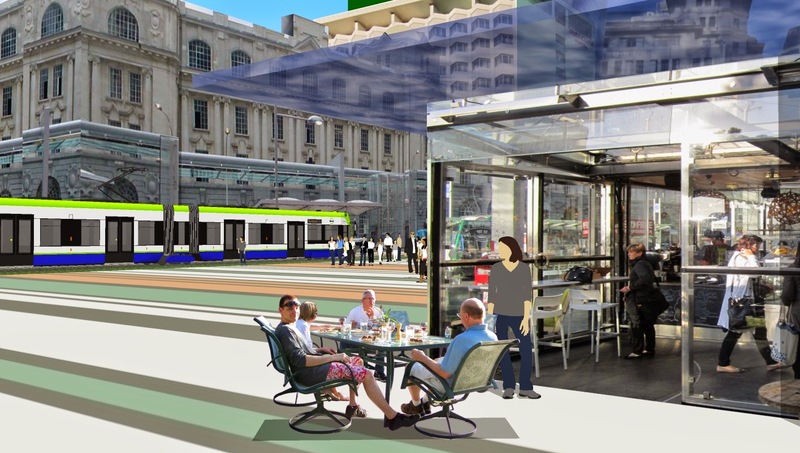 The interchange included a glass covered canopy above bus-shelters which also served as a sheltered walkway for people accessing ferry services from downtown. 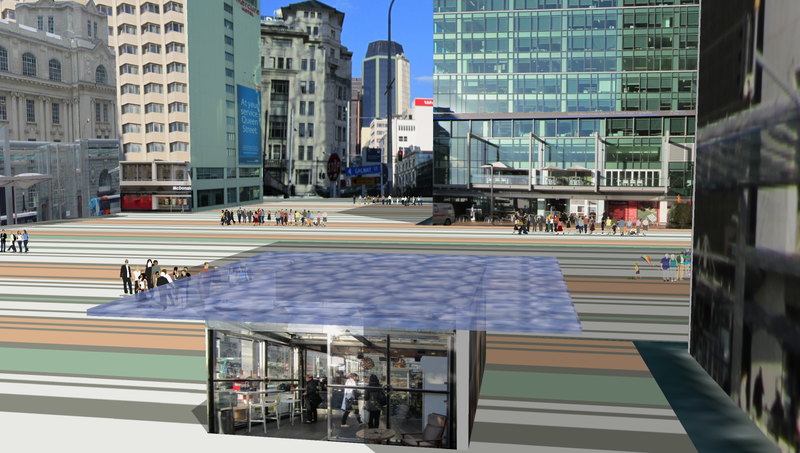 This is gone from my renderings because Auckland Council's plans are to re-locate the QE Square bus interchange. 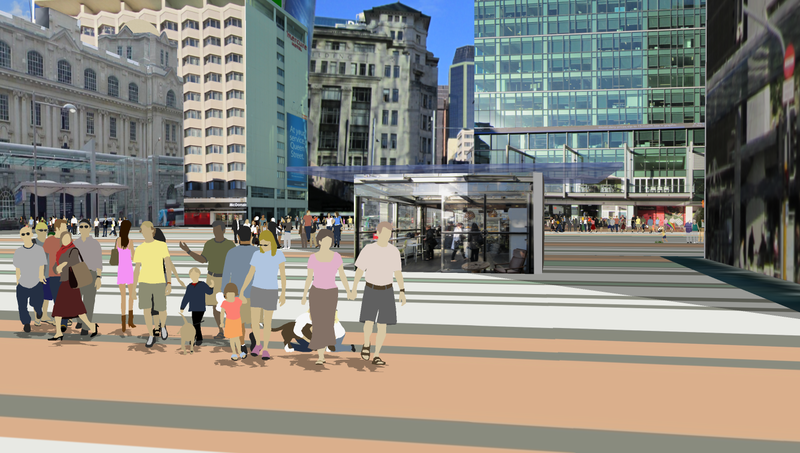 This will be done by expanding the Britomart bus interchange (behind the heritage CPO building which functions as the railway station), constructing a new facility at the bottom of Lower Albert Street, and constructing an interchange on Fanshawe Street across that road from the Eastern corner of Victoria Park. That is what presents a huge opportunity for opening up and rethinking QE Square. There will still be a need to provide for shelter from the elements: sun, wind and rain. Let's see some options for this from Council. If QE Square has to be dug up then perhaps we can construct an underpass pedestrian walkway - following the examples of downtown Singapore and Kuala Lumpur, and line the passageway with well-lit boutique shops and takeaways. This walkway can also connect to ferries and the railway station. On the many good days pedestrians can choose to walk on QE Square - rather than take the underpass. This is to get the creative juices flowing a bit. What Auckland sorely needs now is a joined up vision for the CBD waterfront - what we're planning on doing down there, and what we're not doing down there. Big picture stuff which gives at least as much emphasis to the public realm as it does to providing for urban economic development. 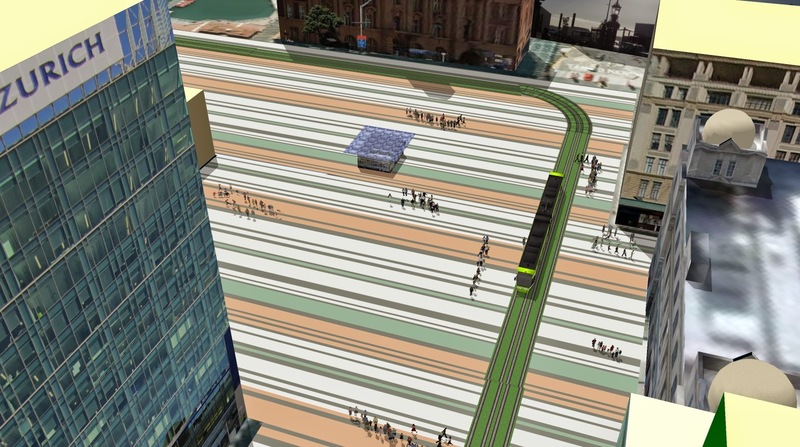 This vision needs to look forward 30 years and should include: the CRL (built - above and below ground); Downtown redeveloped; Queens Wharf developed; Quay Street pedestrianised; Custom Street reshaped; Light rail from Wynyard Quarter inter-connecting with the new bus stations and running up Queen Street; and expanded ferry services. Broad brush stuff. Detail can come later. And it needs to be done with public engagement and participation. The opening was for GridAKL, which is a collective workspace for digital entrepreneurs that is housed in the refurbished Polperro building (see pic, it fronts onto Halsey Street, you can see from the reflections in its windows that it has great views over the Viaduct to CBD skyline...). The opening speeches were by ATEED CEO (Brett O'Riley), Mayor Len Brown, and MBIE cabinet Minister Stephen Joyce. ATEED studied models in California’s Silicon Valley and worked with MIT in Boston through its Regional Entrepreneurship Acceleration Program to shape the planned precinct. The Government was involved in the initial feasibility study, and Brett O’Riley expects it will have a future role in the development. “Grid AKL is based on global best practise for creating an environment to stimulate innovation and collaboration. It will be part of the wider innovation ecosystem, and be part of ATEED’s work with tertiary and research institutes to capitalise on the Government’s new acceleration and incubation programmes,” says Brett O’Riley. 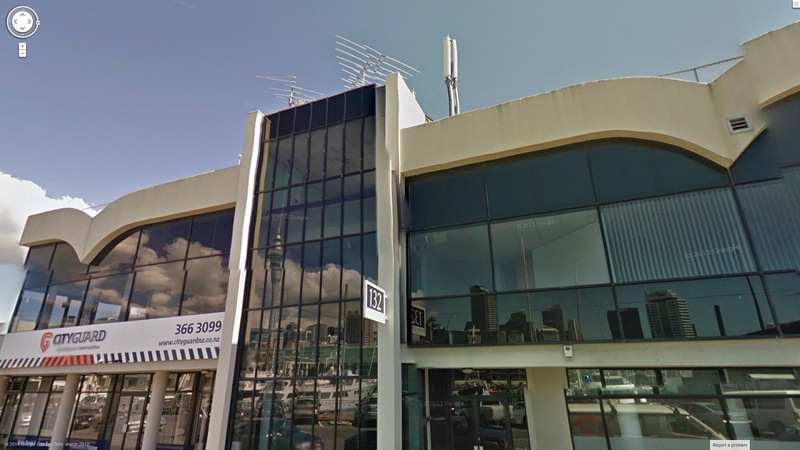 The GridAKL space will host a range of business incubation programmes and there's a purpose-built event space for GridAKL residents and the wider community. A tech café on the ground floor of the Polperro building will be open to the public in June and will provide a drop-in collaboration space for the technology startup community in the area. Once the Lysaght building is overhauled by early 2015, companies with as many as 200 staff and with international operations will be able to move in. And for those of you after a few more pics and details from the launch event, I have included below a selection of open plan incubator space itself (you will see a variety of working areas, and the fact you plug into the ceiling for communications and IT - so the space is very much a "hot desk" environment.) I have also included pictures of the window display which contains detail about where this project fits within the overall Wynyard Quarter, and Auckland Council economic development vision and plans. The Auckland Development Committee, of Auckland Council, on 15th May 2014, voted 14-7 to sell "in principle" part of Auckland City's downtown civic square (aka Queen Elizabeth Square), because of an "opportunity" that has arisen associated with an adjacent property development by Precinct Properties. This video is Joel's reasonably raw reporting (from his notebook) of who said what at that meeting, and his reflections on the quality of debate and decision-making. These pictures were all taken about 9:00am on Friday morning, May 16 2014. So it's late in autumn. Sun is low, but for a while at this time of year QE Square is a nice place to be. It has been like this in public ownership since the 1970's, I understand. Before that the land was taken up with older style buildings not unlike those we can see still standing in Britomart. Other cities around the world recognise that ensuring success in public spaces is a constant challenge. They remain works in progress. 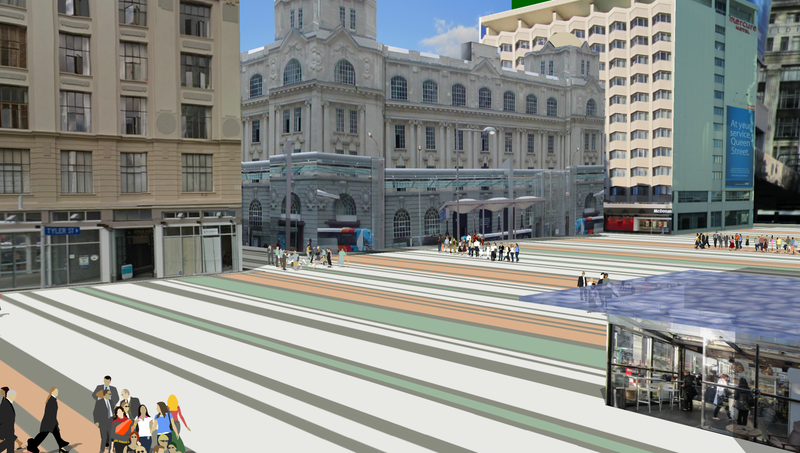 Auckland now has the opportunity (with demolition of Downtown Centre and earthworks associated with the proposed Central Rail Loop) to improve Queen Elizabeth Square - but not to sell it. 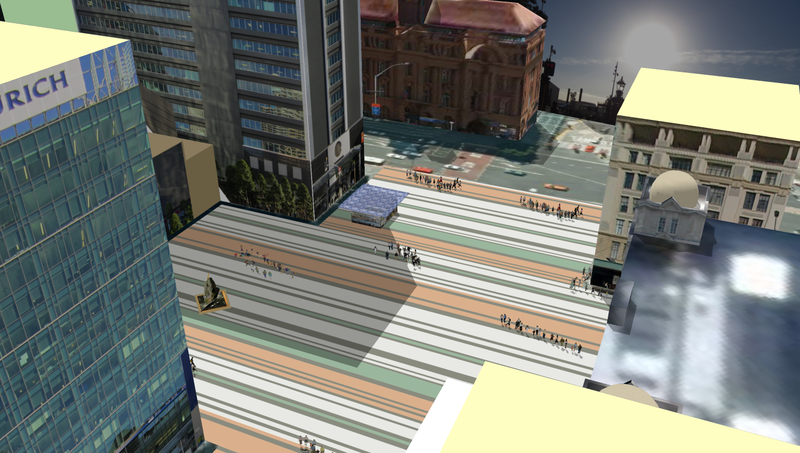 Auckland Central is very poorly provisioned with good sized, centrally located, successful, civic spaces suiting a city of more than 1.5 million souls. When I was there this morning, the police were there supporting a "Time4Youth" community fund raiser campaign "focussing on helping teens all over New Zealand..." Part of Blue Light youth charity's work. It's not as if Precinct Properties are going to be short of passing trade when their development is completed. A pity perhaps that with its large proportion of overseas investment that profits will likely leave New Zeraland, but surely that is enough. Provide access to Auckland pedestrians, but don't let them have Auckland's public space as well. That's not a good equation. The pedestrian walkway can be shifted, or changed. 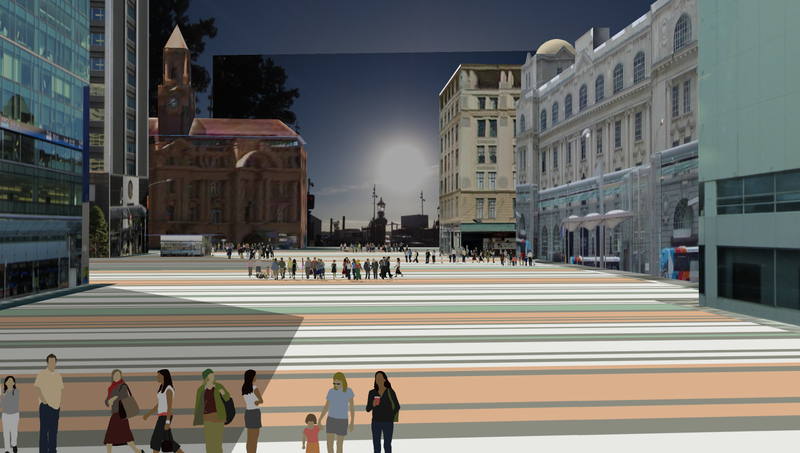 perhaps its alignment would be better closer to the railway station - creating a larger coherent civic space. 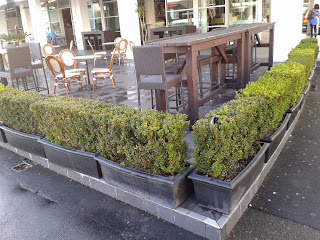 Yes, this area is sometimes shaded, and it is sometimes windy - but nothing like Wellington. All built public spaces are in the shade for part of the day. What's new in that? 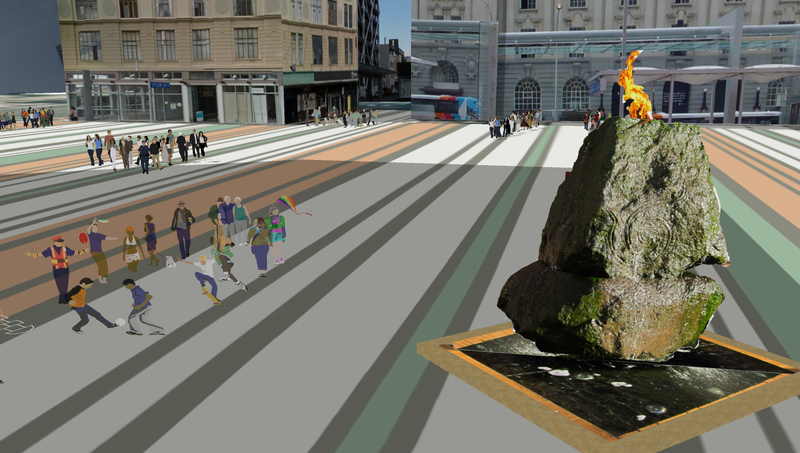 But if Queen Elizabeth Square was widened, then parts of it would more often be in sunshine. In summer, when the sun is almost overhead, Queen Elizabeth Square is bathed in sunshine most of the day. Don't forget that. These next 3 pics are from slightly higher in the Britomart building. Again, I draw your attention to the dismal outlook of the Downtown Centre. Its uninteresting, unarticulated wall does not attract interest. Look at these pics and think. 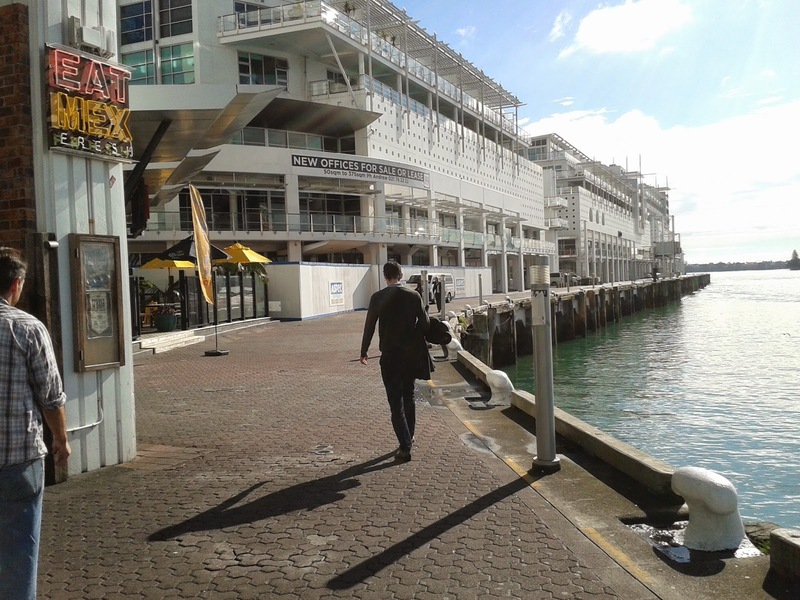 Surely it is right for Auckland Council to consider who these public assets - including Quay Street and Queens Wharf - can be seen in an integrated way, but from the view point of Auckland's citizens first, not from the point of view of how many bucks can be made from an overseas investor. 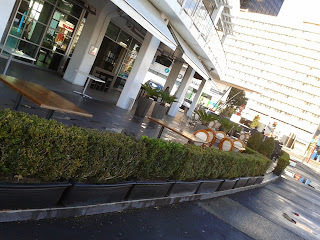 Interestingly we had Auckland Transport down here also, at the Glass Box, offering free bike checks. Thanks for that anyway. Council Banking on Market Failure?